Five themes emerge from our assessment of Apple’s latest supplier responsibility report (Apple 2014a), which was released in February and which reports on conditions in its supply chain during 2013. Our focus is on the labor rights aspects of the report, and not the environmental aspects. The effects of Apple’s reforms are often dubious and overstated by the company. For example, Apple places great emphasis on its data indicating that fewer workers in its supply chain are working more than 60 hours per week, yet ignores altogether the fact that workweeks at its Chinese factories still consistently break Chinese law (which Apple has repeatedly pledged to uphold). The average workweek Apple reports still exceeds, by a substantial margin, the 49-hour limit imposed by Chinese law. Further, Apple’s new measure to address the widely reported problem of abusive student internships focuses primarily on improving the schools the interns attend. This does not address the actual labor rights violations at issue: These internships have often been involuntary—a form of de facto forced labor—and exploitative. Suppliers have placed students in production jobs that have nothing to do with their studies and subjected them to harsh conditions, oftentimes to meet Apple’s unforgiving production schedules. In another example, Apple makes the remarkable claim that its suppliers have achieved a 99 percent compliance rate on freedom of association (the right to organize unions and bargain collectively), although such freedom is a legal and practical impossibility in China, as recognized by virtually all observers (other than factory owners and the Chinese government). Moreover, a program of remedies to this issue that was supposed to have been advanced through the Fair Labor Association (FLA) process has fallen woefully short of its stated goals. Apple has also touted training programs under which, according to the company, 1.5 million workers were trained in labor rights in 2013, a large number to be sure. Unfortunately, it is the suppliers themselves, not worker rights advocates or worker representatives (and not even Apple or its new training academy), that provide this training, and Apple provides no substantive information on its actual content or impact. Independent reports indicate that this management-provided training may be entirely cursory. Apple has apparently walked away from key reforms promised as part of the FLA process. In the wake of media criticism of the treatment of workers in its supply chain, especially at its largest supplier, Foxconn, Apple publicly recommitted itself more than two years ago to advancing fundamental reforms, this time through its new membership in the FLA. Since then, however, the company and the FLA have largely gone silent regarding certain crucial commitments they made. In the area of wages, for example, the new Apple report neglects to report on developments (if any) regarding promises that Foxconn would increase take-home pay to offset promised reductions in work hours. Nor does Apple mention the promise that suppliers would pay back wages to the large number of workers found to have worked (illegally) unpaid overtime hours. We are among those who have regularly reported these and other apparently broken promises, but Apple has yet to respond. Apple’s self-regulatory approach raises independence and accuracy concerns; independent reports continue to paint a far more troubling picture of Apple’s supply chain. Apple has greatly increased the number of factory audits that it performs, but these audits are not carried out in an independent manner, and the information contained in them is reported selectively, by Apple. Apple’s supplier annual responsibility reports—which draw on these audit reports to broadly characterize conditions in the supply chain, but which reveal few or no concrete, factory-specific details—should thus be treated with ample caution, especially given the failed history of industry-controlled factory auditing programs. Meanwhile, reports about particular Apple facilities from independent investigators describe labor conditions far worse than those generally portrayed by Apple. Just in February 2014, for instance, China Labor Watch released a report regarding one Apple supplier that found brutal working conditions that violate Apple’s standards, essentially across the board. A 2013 investigation by China Labor Watch of factories operated by Apple’s second-largest supplier, Pegatron, found 17 basic areas where working conditions failed to meet Apple’s code of conduct. There has been progress in some areas. Working hours, though still well in excess of legal limits, have apparently been reduced significantly. Apple now discloses the names and locations of its supplier factories—information no other major electronics brand provides—and Apple released, in this year’s supplier responsibility report, unusually detailed “Supplier Responsibility Standards,” which lay out Apple’s official expectations concerning suppliers’ labor practices. While compliance is very much in question, access to the detailed requirements is of use to the public and to worker rights advocates. Further, Apple reports that it started a new training academy that conducts an 18-month training program for management personnel in its supply chain on environmental and health and safety issues; to the extent that this academy provides effective education about employer obligations and professional managerial training, it may help fill important knowledge gaps in an industry where expertise on worker rights and safety has not historically been a professional development priority for factory managers. Apple also says it now verifies that all the tantalum smelters in its supply chain are “conflict-free”; the authors of this analysis are not in a position to independently evaluate that claim, but respected environmental organizations, including Greenpeace International, consider Apple’s commitments in this regard to be significant. Each of these themes is elucidated below. Many “accomplishments” touted by Apple represent actions that, upon inspection, are far less meaningful than Apple indicates. Apple’s unduly positive characterization of these actions is an important reminder to readers that, while the depth of Apple’s concern for the well-being of workers remains in doubt, the depth of its concern for its public image does not. Apple reports that 95 percent of the weeks worked by employees in its supply chain met its standard of 60 hours or less (Apple 2014a, 5), conveniently omitting any reference to Chinese law, which limits workweeks to 49 hours. The reported compliance rate is somewhat higher than the 92 percent figure it claims for 2012 (Apple 2013, 6) and is sharply higher than the 38 percent figure for 2011 (Apple 2012a, 7). While the degree of compliance may be overstated (see just below), this is significant progress. The fact remains, however, that this still leaves many Apple factories regularly exceeding legal overtime limits. Apple reports that the average workweek for the full-time workers in its supply chain is 54 hours per week (Apple 2014a, 11); that is, 54 hours of hard, repetitive, physical labor. Thus, the average workweek exceeds legal limits in China, where most of these workers are located, by more than 10 percent (the law, of course, requires all workers to work within the legal limit; Apple’s suppliers cannot even meet this standard when hours are averaged). Apple has allowed these systematic violations of overtime law even though the FLA’s engagement with Foxconn promised to achieve full legal compliance by July 2013 (Fair Labor Association 2012a). It must be noted that Apple’s Code of Conduct (Apple 2014b) has stated for nearly a decade that its suppliers must abide by all applicable local laws. In view of the above, it is stunning that the legal 49-hour Chinese standard is never mentioned in Apple’s supplier report. To make matters worse, there are doubts about the accuracy of Apple’s claim of 95 percent compliance with its 60-hour standard. A recent China Labor Watch study found that the Pegatron factory in Shanghai, which produces iPhones, has a policy of falsifying work hour records to hide excessive duration. The study found that at Pegatron, “[w]orkers are required to sign [a false overtime form] and are not to pay attention to the number of hours written on the form; the document’s only purpose is to deceive Apple during inspections” (China Labor Watch 2013a, 16–17). Another “accomplishment” highlighted by Apple is a new effort it says is designed “to protect student workers from exploitation” (Apple 2014a, 4). The claim is likely inspired by the heavy criticism key Apple suppliers have received for colluding with the Chinese government and school officials to effectively compel thousands of students to toil on electronics production lines, under the guise of academic “internships,” and for the abusive conditions students experience, even if they take the positions voluntarily. This is a means for factories to address labor shortages, particularly at peak production periods. Students have frequently been told that they will not be allowed to graduate unless they succumb. Unfortunately, Apple’s new effort primarily focuses on improving the educational experience at the schools supplying these workers, which has nothing to do with the fundamental problems of de facto forced labor and abusive working conditions that characterize these internship programs. As China Labor Watch’s report on Apple’s supplier Pegatron finds, certain suppliers rely heavily on student interns for production positions that have nothing to do with their academic studies and the use of coercive means to compel students to participate (China Labor Watch 2013a). One other “accomplishment” cited by Apple deserves particular notice, as it illustrates the extent to which Apple’s supplier report can mislead the public. Apple reports near-perfect compliance (Apple 2014a, 32) when it comes to “freedom of association” (the right to organize unions and bargain collectively), a claim it also made in previous years. Virtually all observers, however, recognize that such freedom is non-existent (indeed, is legally impossible) in factories in China, where the only legal union is controlled by the Chinese Communist Party. Workers in China cannot legally organize independent unions and typically have no ability to change practices in their workplaces through collective bargaining or other legal mechanisms. (Where Chinese workers have been able to influence labor practices, it has invariably been through illegal strikes and other forms of protest—including, in the most extreme example, the worker suicides that generated international embarrassment for Apple and Foxconn.) As discussed in the FLA section below, even the modest reforms pledged by Apple to ameliorate this denial of basic rights have fallen far short of stated goals. Apple muddles the issue by making the freedom of association requirements in its standards subordinate to local law, an approach used in the codes of conduct of many global corporations that manufacture in China. Since Chinese law does not permit freedom of association, this approach effectively dodges the issue. Notably, Apple, in claiming 99 percent compliance with freedom of association, fails to explain this distinction to readers. Also of interest is Apple’s statement that it has “driven” suppliers “to train more than 3.8 million workers on their rights since 2008—including over 1.5 million in 2013 alone” (Apple 2014a, 5) and, in the full body of the report, that it requires “training for new and existing employees about Apple’s Code of Conduct, local laws, and occupational safety and health” (Apple 2014a, 7). Such training can be of value, if properly designed and delivered by people who have relevant knowledge and a genuine commitment to advancing worker rights. Such training is much more effective if it is conducted by non-governmental organizations, unions, or qualified government officials, and not by the employers themselves. Employers have a large conflict of interest when it comes to educating workers about their rights, all the more so when the rights in question are ones the employer has been routinely violating. Nor do most factory managers in China have the knowledge of and respect for worker rights necessary to educate others on the subject. Apple, however, does not explain who provides the training or provide any concrete information on its scope or content in practice. Information from independent reports, moreover, suggests that this training can be purely cursory. China Labor Watch, for example, investigated conditions at three Apple suppliers in 2013. Its just-released investigation of Quanta’s Shanghai facility, whose products include Apple computers, found that only 10 minutes of safety training is provided to new employees, even though it is a particularly dangerous facility, with the production process involving several hazardous chemicals and gases (China Labor Watch 2014). Its investigation of Jabil’s Green Point factory (which makes rear plastic covers for iPhones) found that worker training lasts only two hours, that exam answers are given to the workers to be copied down, and that information on safety is lacking (China Labor Watch 2013b, 4). Its investigation of Apple’s second-largest supplier, Pegatron, found that its trainings lasted eight hours (just one-third of the 24 hours required under Chinese law), and “simply consisted of rolling through perfunctory slideshow presentation[s], after which workers were told to copy answers to all questions on the training test” (China Labor Watch 2013a, 5). Apple’s supplier responsibility report contains information on eight categories of practices related to labor and human rights and seven categories related to worker health and safety. Although Apple typically does not discuss changes over time in these categories, roughly comparable data from its previous reports are available back to 2009. We have compiled that data in the two tables below. * This category was called "prevention of involuntary labor" for the data from 2009 to 2011. ** This category reflects compliance with Apple's 60-hour standard instead of relevant legal standards, including China's. *** Since overall compliance reflects inaccurate information, such as the near-perfect scores in the freedom of association category, the figure is likely not useful. Table 2 depicts trends in the area of worker health and safety. Here essentially no overall progress is indicated. Overall compliance in 2013 was only 1 percentage point higher than the compliance rate Apple reported in 2009. More than one in four occupational injury protection practices are still not in compliance. Nearly one in four emergency practices are not in compliance. Some 30 percent of ergonomic practices fail to comply with Apple’s standards. And despite Apple’s assertion of widespread communication programs, more than one in four health and safety communication practices are not in compliance. All of these data are, of course, entirely self-reported and cannot, in and of themselves, constitute persuasive evidence of progress in those areas where Apple claims it. However, Apple has no incentive to underreport compliance; the fact that high levels of non-compliance are reported is thus revealing. One other point should be mentioned: Since the number of facilities audited has increased significantly, the figures for each year apply to different sets of facilities. If Apple would release audits of the individual facilities and not just aggregated data, it would enable an assessment of reported developments among consistently audited facilities. In January 2012, and in the wake of intensifying media criticism of labor practices in its supply chain, Apple joined the Fair Labor Association, committing itself to abide by its standards. The next month Apple announced the initiation of “unprecedented” FLA investigations (Apple 2012b). In late March 2012, the FLA released its findings from its “audits” of three Foxconn facilities supplying Apple and announced a series of fundamental reforms that Apple and Foxconn pledged to implement by July 2013 (Fair Labor Association 2012a). Apple’s widely cited same-day response to the FLA report fully embraced the proposed reforms, stating in part, “We appreciate the work the FLA has done to assess conditions at Foxconn and we fully support their recommendations” (Pepitone 2012). More than two years after this process began, and more than six months since the passage of the July 2013 deadline, reforms in several critical areas have still not occurred. The latest Apple supplier responsibility report was another chance for Apple to explain this failure, but the report is altogether silent about the FLA process and what has been accomplished. The only mention of the FLA is on page 27, when it includes the FLA in the list of organizations that it draws on for its standards. This raises the question: Has Apple walked away from essential commitments made in the FLA process? A second unfulfilled commitment relates to freedom of association and providing workers with a “voice.” This promise was featured prominently by the FLA, but, as of now, the only “progress” that has been made was to appoint some worker representatives to the leadership of management-controlled unions—but not enough worker representatives to prevent management from retaining control. In other words, two years after Apple, Foxconn, and the FLA heralded reforms to enable workers to have a voice and act collectively to protect their rights, the only collective worker bodies in Foxconn facilities are unions run by factory management. The lack of progress concerning promises on compensation is especially egregious. The promises here included raising wages enough to offset any reductions in hours; providing back pay to the large number of workers who worked unpaid or underpaid overtime as a result of longstanding illegal pay practices by Foxconn; and conducting a study, to be carried out by the FLA, to determine the amount of compensation necessary for workers to meet their basic needs (in March 2012 the FLA (2012b, 9) found that nearly two-thirds of a representative sample of workers at Foxconn said their compensation was not sufficient to do so and promised the study as a step toward addressing the problem). The FLA has not reported progress in any of these three areas, and the latest Apple supplier report is entirely silent on these issues. One other promise, made explicitly by Apple in early 2012, was that “[s]imilar inspections [to those at Foxconn] will be conducted at Quanta and Pegatron factories later this Spring, and when completed, the FLA’s assessment will cover facilities where more than 90 percent of Apple products are assembled” (Apple 2012b). None of these additional inspections has apparently taken place, meaning that the FLA assessed facilities employing less than one-fifth of the Chinese workers in Apple’s supply chain. While the FLA audits have important weaknesses, they are at least more transparent than the audits done by Apple, which are never made public. Moreover, Apple presented the FLA’s sweeping audit plan as the centerpiece of its reform commitment; it is remarkable that much of this plan was apparently never carried out. The deficiencies discussed above point to an overarching concern: Apple’s approach to improving labor conditions in its supply chain largely consists of conducting audits that are neither independent nor transparent, and of promises that lack an outside enforcement mechanism, and thus are less likely to be fulfilled. Apple (2014a) conducted 451 audits of its supply chain in 2013, a sizable 51 percent increase from 2012. These audits, according to Apple, covered nearly 1.5 million workers. All of its final assembly manufacturers are audited each year, and 33 of the audits focused on the critical issue of the treatment of migrant workers. Thirty-one of the audits were “surprise” audits. Apple also indicates it demands remedies for any violations found by its audits. As impressive as this may sound, it is vital to understand that apparel brands, toy manufacturers, and other companies have been doing this kind of labor rights auditing at their suppliers for many years; many of the major companies have been doing so since the 1990s. The track record of these comprehensive audits is dismal: Major violations are routinely missed, and genuine labor rights progress is scant. The most gruesome example is Bangladesh, where garment workers died en masse in a long series of preventable fires and building collapses despite years of industry-run safety inspections. Apple itself has failed in the past, by its own tacit acknowledgment, to crack down on repeat violators, even though it promised repeatedly to do so. It is thus incumbent upon Apple to demonstrate that its expanded audit program is leading to actual reforms. For example, this means Apple should not simply assert that it demands remedies for violations that it finds, but should supply credible evidence that remedies have been implemented. As far as the lack of independence of the Apple audits, note that the standard audits are carried out by Apple itself, and are directed by an Apple auditor. There is an obvious conflict of interest when a company investigates its own supply chain, draws its own conclusions, and then selectively publishes results. Information from workers also appears to be primarily collected through interviews conducted inside the factory, when the preferred method (because it is more likely to lead to accurate results) is to gather information through off-site interviews. Apple’s supplier responsibility report does mention it has established channels for workers to provide information separate from the on-site interviews, through off-site phone calls, but it is unclear how much information has been provided through this approach. Then the data are presented in aggregate form, with little information on how they are assembled and without releasing the individual audits. This makes it difficult for those outside of Apple to hold individual facilities accountable, or to check Apple’s findings against independent investigations. For these reasons, the information found in the Apple supplier responsibility report should be assessed with great caution. This is especially so since independent assessments of Apple’s suppliers, two years after the FLA process began and seven years since Apple initiated its audit process, continue to uncover harsh working conditions that deviate sharply from the code of conduct Apple has claimed it is vigorously enforcing, and from the sunny picture of progress described in its latest supplier responsibility report. Over the past year, for instance, China Labor Watch has conducted independent, undercover investigations of three Apple suppliers (China Labor Watch 2013a, 2013b, 2014). Two of the suppliers examined, Pegatron and Quanta, were singled out as facilities that Apple said would be investigated in a second phase of FLA work; as noted, these investigations have apparently not occurred. The third investigation was of a Chinese factory owned by Jabil Circuit, a company based in Florida. All three of these investigations found working conditions that can only be described as deplorable. At this moment, in Shanghai, China, workers in Apple’s supplier factory Pegatron are monotonously working long overtime hours to turn out a scaled-back, less expensive version of the iPhone. Six days a week, the workers making these phones have to work almost 11-hour shifts, 20 minutes of which is unpaid, and the remainder of which is paid at a rate of $1.50 an hour ($268 per month) before overtime. This is less than half the average local monthly income of $764 and far below the basic living wage necessary to live in Shanghai, one of [the] costliest cities in China. So these workers rely on long overtime hours. If a worker does not finish three months at Pegatron, the dispatch company that got the worker hired will deduct a large portion of his wages. After a grueling day’s work, what a worker has to look forward to is a 12-person dorm room, lining up for a quick cold shower in one of the two dozen showers shared by hundreds of workers. At Pegatron, over 10,000 underage and student workers (interns), from 16 to 20 years of age, work in crowded production rooms, doing the same work as formal, adult workers. But some students are paid lower wages because schools deduct fees for the internship, while other students will not have their wages paid to them on time. At Pegatron, a pregnant woman interviewed was working equally long overtime hours, despite Chinese laws protecting the health of pregnant women by mandating an eight-hour workday. After four months of intense work, she decided to leave and give up her maternity benefits rather than jeopardize the health and well-being of herself and her unborn child. In addition, Pegatron has violations related to discriminatory hiring, harassment and abuse, fire safety, and more. A follow-up study of Pegatron zeroed in on its treatment of student workers. Disturbingly, China Labor Watch found that the wage abuses of student workers were even worse than those indicated by its initial report (China Labor Watch 2013c). Apple may assert that the violations have been remedied in all these factories or that the China Labor Watch information is not fully accurate. If so, Apple should provide documentation about the remedies and should offer up its own detailed information on conditions in these factories. One area of progress has been a significant reduction in work hours. As discussed, however, this progress falls dramatically short of complying with China’s legal limit. Much of the progress in reducing work hours occurred from 2011 to 2012 and was reported upon in the previous suppliers’ responsibility report. That report also featured Apple’s disclosure of the names and locations of its supplier factories. Apple remains the only major electronics brand to release this information. 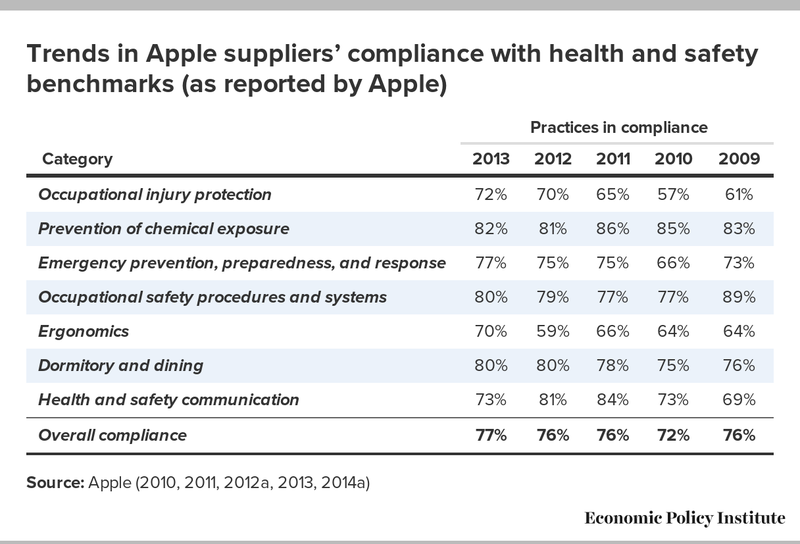 Apple also initiated the Apple Supplier Environment, Health, and Safety Academy. This academy is designed to help address the absence of expertise in these areas among management personnel in its supply chain. Apple indicated that more than 240 factory personnel enrolled in this 18-month program in 2013; attendees came from factories with more than 270,000 workers. It is too early to assess the outcomes of participation in the academy, and Apple should be transparent in the future about its impacts in the factories themselves, but this could be an important effort at raising management expertise concerning environment, health, and safety issues. The impact of the academy would also be greater if it incorporated training for workers, so that they could play an active role in hazard detection and finding solutions to problems. Apple also verified that all the tantalum smelters that are actively serving its supply chain have been certified as conflict-free by third-party auditors. Since tantalum can be produced in an unethical manner that benefits armed groups and human rights violators in countries such as the Democratic Republic of the Congo, this is a significant step. Of note, in the wake of Apple’s latest supplier report, Greenpeace released a statement praising Apple’s efforts to reduce its use of conflict minerals (Greenpeace 2014). Notwithstanding some areas of actual progress, working conditions in Apple’s supply chain remain grim for many workers. The claims made by Apple in its report are often misleadingly rosy, presumably designed to deflect attention from the serious labor rights violations that even its own data suggest remain common—and which independent reports continue to find with dismaying consistency. The latest report also provides further evidence that Apple is walking away from critical commitments made when it formed its partnership with the FLA. The company made those commitments the centerpiece of its pledge to advance fundamental reforms in its supply chain, at a time when such a pledge was a public relations necessity, because of withering and widely publicized criticism of the company’s labor practices. It is discouraging, if not surprising, that promises made under the pressure of intense media scrutiny were quietly jettisoned when that scrutiny abated. Scott Nova is executive director of the Worker Rights Consortium, a nonprofit labor rights–monitoring organization. WRC conducts independent investigations of working conditions in factories around the world. Its mission is to combat sweatshops and protect the rights of workers who make apparel and other products. Isaac Shapiro is a research associate at EPI and has also analyzed labor policies for the Center on Budget and Policy Priorities, the U.S. Department of Labor, a member of Congress, and the Center for Social Policy Studies.